US registry data show that roughly two-thirds of patients with suspected coronary artery disease (CAD) who undergo invasive coronary angiograms turn out not to have significant stenosis, says Arthur Stillman, MD, PhD, FACR, FAHA. "That's a lot of negative catheterizations done in this country that carry some risk and certainly a lot of expense," says Stillman, chair of the ACR's Committee on Cardiovascular Imaging—Body Imaging and a professor of radiology and imaging sciences at Emory University School of Medicine in Atlanta. "The data show a huge need for a better noninvasive tool to identify those patients who have flow-limiting stenoses and who would most likely benefit from revascularization. Many believe that coronary CT myocardial perfusion imaging could be a good solution—if not just yet, in the near future." For years, radionuclide myocardial perfusion imaging has been used to determine whether patients have obstructive CAD. SPECT has become the gold standard. The idea of using cardiac CT myocardial perfusion as an alternative to SPECT is not new, says U. Joseph Schoepf, MD, director of the division of cardiovascular imaging at the Medical University of South Carolina (MUSC) Heart & Vascular Center in Charleston. In the late 1970s, he says, when electron beam CT was introduced, it was for that very purpose. "It was the original tenet of this type of machine," Schoepf says. However, electron beam scanners were hijacked for the commercial purpose of cardiac calcium scoring. About seven or eight years ago, Schoepf says, researchers discovered that new multirow CT detectors—the prevailing CT technology used today—also could be used for myocardial perfusion imaging. "Since then, people have developed various approaches to myocardial perfusion imaging with that particular scanner class and that application is really taking off," he says. "A lot of people are really excited about it." As scanner technology has advanced, CT angiography has become increasingly attractive as an alternative/replacement for nuclear stress testing to assess the coronary arteries. (See "Change of Heart [Tests]" in the January 2015 issue.) CT angiography by itself has a very high negative predictive value, Stillman says. "If the test is negative, you can eliminate a lot of the need to work the patient up further." However, the positive predictive value of CT angiography is not as good, he says. The addition of cardiac myocardial perfusion imaging to CT angiography is helping to make CT angiography's positive predictive value that much better. In 2015, Johns Hopkins Hospital in Baltimore became one of a few sites in North America to use CT stress myocardial perfusion imaging in a clinical setting, says Armin A. Zadeh, MD, PhD, director of Johns Hopkins' cardiac CT program. "And we are using it with success," Zadeh says. At Hopkins, when patients who present with chest pain undergo a CT coronary angiogram and no disease is detected, that patient is sent home. "No further workup is needed," Zadeh says. If the CT coronary angiogram shows disease in a moderate range, from 50% to 60%, the patient is asked to stay and a second set of images is acquired using pharmacological stress agents, typically adenosine, dipyridamole, or regadenoson. The additional scan adds about 30 minutes to the study, Zadeh notes. The majority of that time is spent setting up the room and patient for the infusion of the vasodilator and securing consent forms. The additional scans that are needed take only a few minutes, he says. About one-third of all patients who undergo cardiac CT angiograms have some CAD, but the percentage with severe disease is much lower, Zadeh says. "Maybe 10% to 20% have so little disease that the decision about what to do is already made. They don't need further testing and can be managed with medication." The addition of myocardial perfusion imaging can help guide management of patients whose disease is possibly more severe and may need revascularization procedures, he says. CT perfusion is very good at helping physicians determine if the lesions they see are flow limiting or not. Zadeh is one of several authors of a paper published in Radiology in August 2014 that showed myocardial perfusion imaging with CT was slightly superior to SPECT for the diagnosis of CAD. "Its success in our head-to-head comparison was driven in part by the higher sensitivity for left main and multivessel disease," Zadeh says. The study involved 381 patients at 16 centers from November 2009 to July 2011. Patients underwent rest and adenosine stress CT perfusion imaging and rest and either exercise or pharmacologic stress SPECT before and within 60 days of coronary angiography. CAD was found in 229 of the 381 patients (60%). The sensitivity of CT perfusion imaging proved to be higher than that of SPECT—88% vs 62%. Another randomized, multicenter study published in the Journal of Cardiovascular CT in February 2015 found that myocardial perfusion imaging with regadenoson CT perfusion and SPECT CT were comparable in detecting the presence or absence of ischemia in 110 patients. Another key study, the CORE 320, was published in the European Heart Journal in November 2013. It found that the combination of CT angiography and perfusion imaging identified the same patients with flow-limiting CAD (greater than 50% stenosis) as SPECT. Zadeh expects that CT myocardial perfusion imaging will always be an adjunct to coronary CT angiography. "I don't see it being used as a standalone modality," he says. It is more practical to add CT perfusion to the CT angiogram than to bring the patient back another time, says Matthew Budoff, MD, a past president of the Society of Cardiovascular Computed Tomography, program director and director of cardiac CT in the division of cardiology at the Harbor-UCLA Medical Center in Los Angeles, and an author of the Journal of Cardiovascular CT study. If Budoff knows the patient already has a stent, bypass, or high calcium score, he will add CT perfusion prospectively. "The other option is to leave the patient on the table and take a look at the images from the CTCA [CT coronary angiography]. If it looks like there's a problem, then you can add perfusion right there," he says. In his experience, Budoff says, he has found about one out of four patients may have significant perfusion defects that need further investigation or treatment after undergoing myocardial perfusion imaging with CT. The information from the CT myocardial perfusion scans "gives you a higher level of confidence when deciding whether the patient needs to go to the cath lab." Stillman says it's best not to add CT perfusion to the exam if it's not necessary because it exposes the patient to additional radiation, (though the overall dose is still rather low) and because it can be uncomfortable. "You don't want to do it on people who don't need it," Stillman says. Even when CT myocardial perfusion is added to CT angiography, it takes less time than a nuclear stress test, Zadeh says. 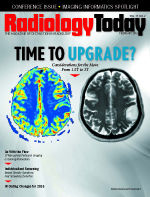 The radiologists agree that probably the biggest advantage to adding perfusion to CT angiography is that physicians can get the anatomical and functional data they need at the same time in one setting. "It's one modality that can basically do both in the scanner room without shuttling the patient back and forth between modalities. That's what makes it so attractive and why everyone is talking about it," he says. CT myocardial perfusion imaging requires a learning curve "if you want to do it right," Schoepf says. However, he says, while it requires some expertise, teams of physicians and technologists who are used to performing nuclear stress testing with pharmacological agents will be able to make the adjustments quickly. "[And] If you're used to performing pharmacological stress MRI perfusion imaging then it's very, very similar," he says. "There is a learning curve, but it's not something that couldn't be accomplished by anybody." Zadeh agrees: "There's a learning curve, as there is with any kind of imaging. But once people get comfortable reading these images, they will be able to do it with consistency and accuracy." Hopkins has a 320-slice detector. Myocardial perfusion imaging may be more difficult with smaller detectors, but it is still possible, Zadeh says. "Acquiring images of the myocardium at different points of time make it harder to look at the blood supply, but people have it done it and shown it works," he says. Schoepf has no doubt that a 64-slice CT scanner can be used to look at the blood content of the myocardium in grayscale. Zadeh suspects that most facilities will have upgraded to scanners with more detector rows by the time everyone is most comfortable using CT rather than SPECT for perfusion imaging of blood flow to the heart. Reimbursement for CT myocardial perfusion imaging is still in development. At MUSC, Schoepf's institution, reimbursement is included in the coronary CT angiogram. "We do not yet get additional reimbursement but feel we are on the verge of going in that direction," he says. According to Schoepf, a number of professional societies have applied for codes for cardiac myocardial perfusion with CT. Other institutions apply codes typically associated with nuclear medicine scanning for functional assessment and some payers have accepted those. "Those are early approaches we're seeing," he says. As the technique and use evolves, Schoepf is confident a billing mechanism will be in put in place. Another option at present for determining the physiological significance of the stenosis is computational fractional flow reserve, which can be done without additional imaging or administering medications. The CT angiography images are sent to HeartFlow in Redwood City, California, which has the proprietary software to perform the calculations and provide an answer the next day, Stillman says. "Computational flow reserve is something a lot of people want to do but don't have the means to right now," he says. Stillman expects that, someday, radiologists will have the software in their offices that will allow them pursue this option as well. CT myocardial perfusion imaging will never be for everyone, Stillman says. "If you have someone who has a contrast reaction history or renal issues, you won't want to give them contrast and so SPECT may be preferred." But he believes that, eventually, fewer patients who present with chest pain or who may be suspected of having CAD will undergo SPECT and more will be diagnosed entirely with the CT scanner. "SPECT is so widely available and many cardiologists have gamma cameras in their office, which makes it a convenience for patients. They can have their tests in the same place they are being seen by their cardiologist," Stillman says. Also, he says, there is an abundance of literature and data to support its use. Still, Stillman predicts as CT technology continues to evolve, CT will become the superior go-to modality for myocardial perfusion imaging. "Myocardial perfusion with CT has certainly shown a lot of promise in properly identifying patients who have heart disease stenosis and who need to go to the cath lab." Colleagues are absolutely interested in pursuing CT myocardial perfusion, Schoepf says. "When I started showing the first images of this technology in 2008 and what we can accomplish at conferences, people were absolutely mesmerized," he says. "There were even a couple of very experienced, dyed-in-the-wool nuclear cardiologists who came up to me and told me this is the future. If you look at the excitement the technique is generating, it's easy to predict that this is something that's going to take off in the next few years."